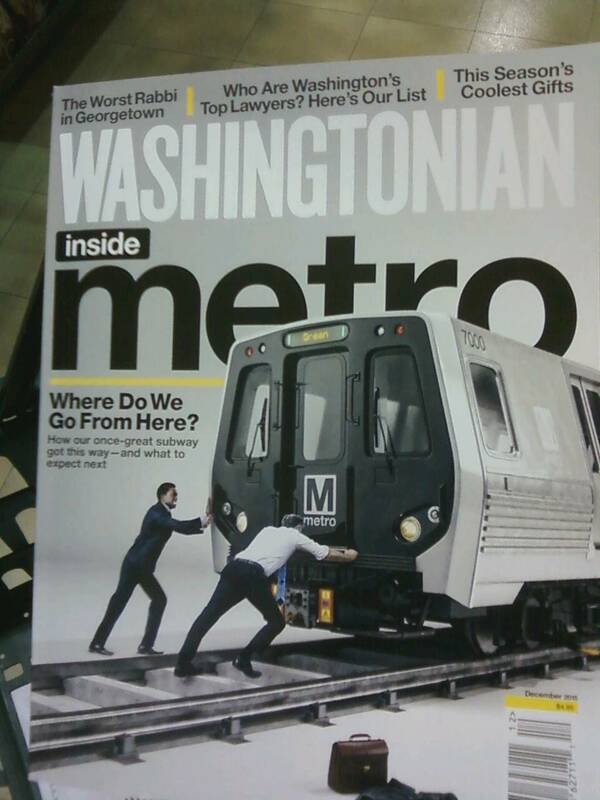 Disclaimer/Note: The authors have no relationship with Washington DC Metro Rail other than as customers who appreciate a nice and quiet train ride, with the comfort and surroundings not commonly afforded on most US mass-transit systems. Removing 1000/2000 series cars and replacing them with less comfortable 7000 series cattle-cars similar to the NYCTA R-143/160 series (which appear to be designed more to be able to quickly hose them down after the cattle (passengers) have left rather than based on passenger comfort (as the R-44/46 and to a lesser extent R-68 cars were) is not the best way to encourage and build ridership, especially in non-commute hours. A boxcar does not a pleasant ride make (not to mention the increased noise from lack of carpets, seat padding, and door screens) and it appears that WMATA is once again promoting their convenience at the expense of customer comfort. 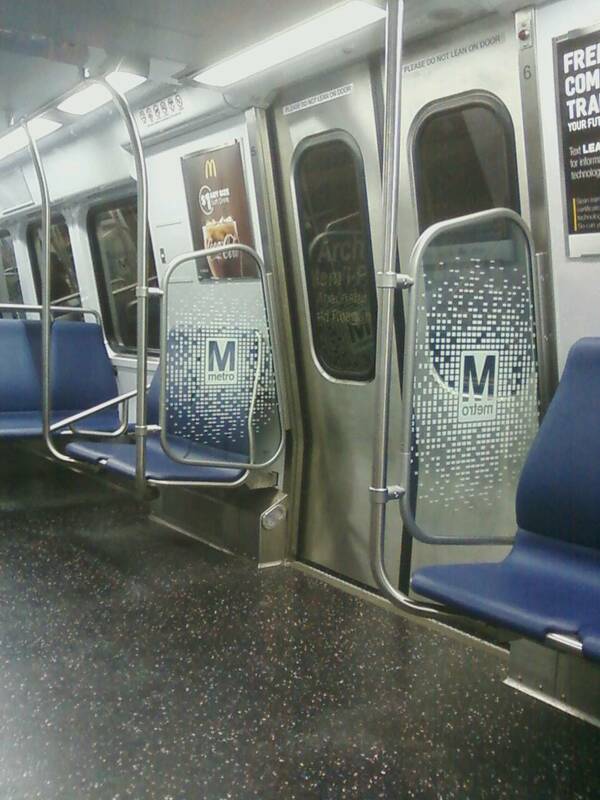 Well, now that we're in May, 2017, it's kind of hard to "stop" WMATA/Metrorail from "implementing" the garish interiors on their new 7000-series rail cars, as the cars are currently in service. Yet despite Metro's typically hyperbolic promotion of the 7000-series cars as more modern and superior to the older rolling stock, it's become obvious that at least some of the concerns articulated on this page over the past three years have generally been on target (we could also say "on track", but we wouldn't do that! 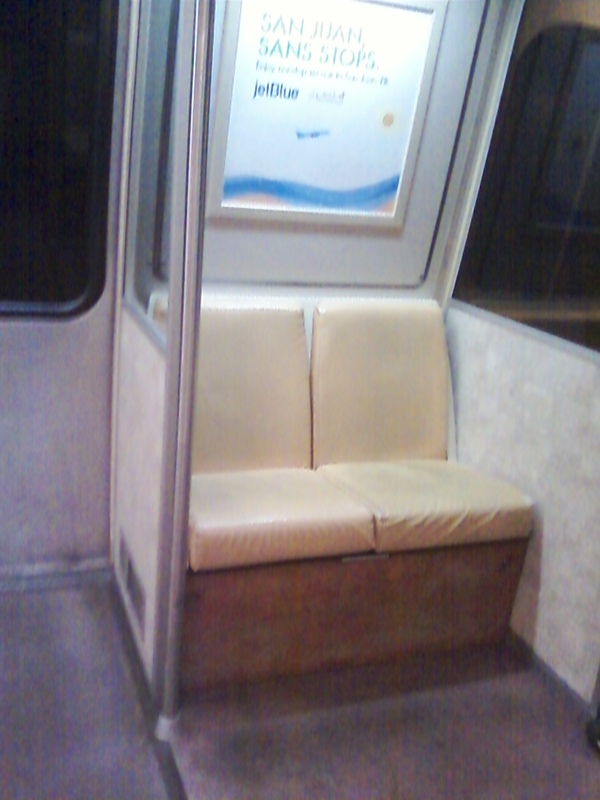 ), such as the noisier ride (likely due to the lack of carpeting and soft paneling on the upper walls and ceilings), unpleasant interior (looks like a transport van with seats), lack of full-length door-screens (allows cold, heat, wind, and rain to come in to the car and affect passengers seated near the doors), unpleasant lighting (Light Emitting Diode/LED lights are fine for street lights, but not the interior of a train! ), and computerized-announcements which sound like they were generated on an Apple II+, to name a few. In any event, and in all seriousness, there seems little at this point that can be done to alleviate many of the passenger-convenience issues with the 7000-series cars; let's hope that enough people complain about the significantly noisier ride, the slippery floors, the Xerox-machine-like lighting, primitive computerized announcements, and the overall feeling that standards are being lowered to save WMATA some money, so that the next batch of cars can hopefully remedy these significant flaws and downgraded passenger amenities. Additionally, besides the passenger comfort issues which promulgated this posting, the Kawasaki 7000 series cars have also been experiencing an inordinate number of technical failures, beyond those of a typical "weaning in" period for new rolling stock, such as a significantly higher mean distance between failure (MDBF) and other passenger movement difficulties, 7000-series cars separating in revenue service with passengers on board, and externally causing problems with Metro's tracks due to the greater weight of the 7000 series cars (and causing more noise and vibration for nearby residents). A prior WMATA manager also appears to agree that Metro should have continued to have regular purchases of the established car models. At the very least, hopefully this can serve as a reminder that WMATA seemingly puts passenger convenience way below costs, so that when the 8000(?) series bids take place, while WMATA will likely patronize the ridership with patently ridiculous claims of the superiority of the passenger amenities of their new rolling stock as they did with the 7000 series, the riding public can use this in some small way as a resource to see that they are yet again being sold a bill of goods, which hopefully they will decline to accept unless significant changes are made to address the deficiencies of the 7000 series rail cars. WMATA has announced plans to implement Spartan interiors on the new the 7000 series cars in the Washington DC Metro subway system to replace the 1000 (and 2000?) series cars. As evidenced in the photos below, the 1000 (and 2000-4000) series cars include cushioned seats, carpeted floors and door screens to reduce noise and enhance the comfort of passengers seated near the doors. 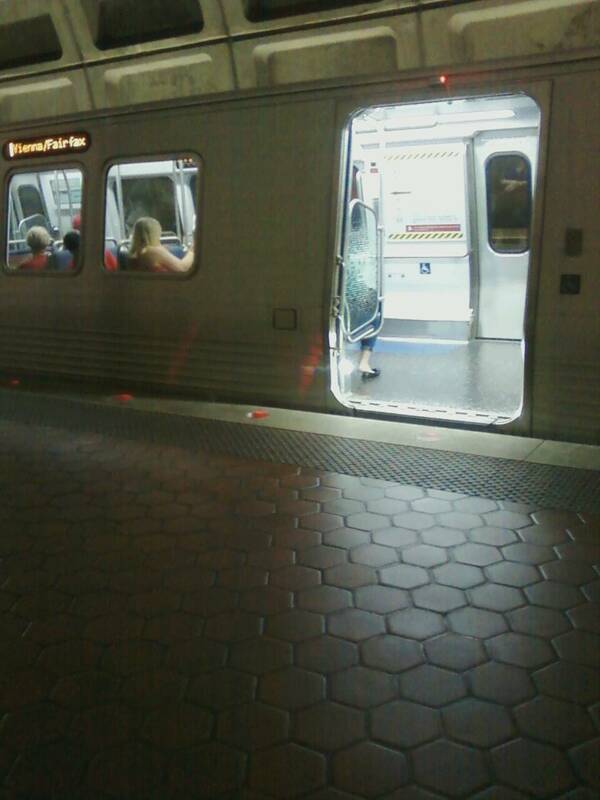 5000 series cars have fewer door screens, and 6000's have only partial (generally useless) door screens (they are only partial and people at the doors can lean onto seated passengers bodily and/or with their belongings). 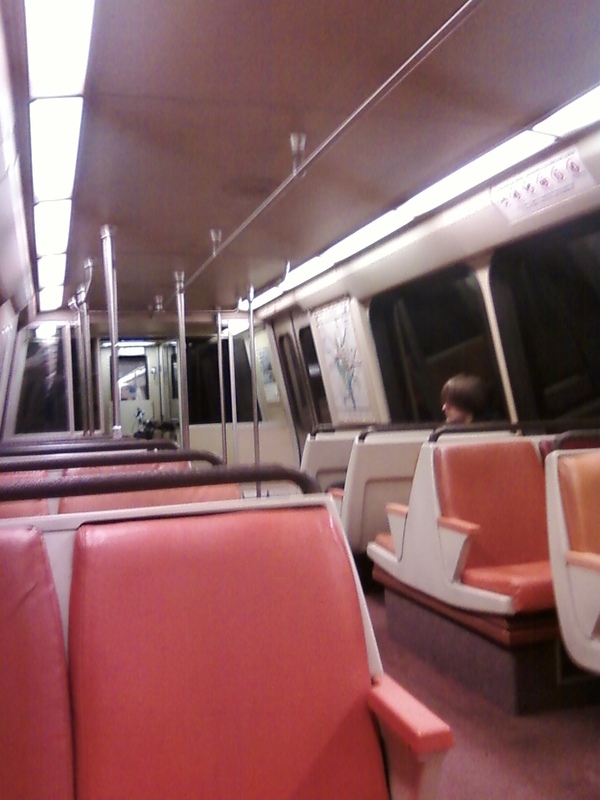 Additionally, four 6000 series cars (also pictured below) have no carpeting at all and offer a markedly noisier ride.WMATA/DC Metro has also recently indicated that they wanted to remove carpeting from all Metrorail cars so as to make it easier to hose them down after the oxen (eg, the riding public) have left for the evening! Noisier Ride: As we feared, the lack of sound-absorbing carpets and upper ceiling padding (near the lights on older series cars) seems to result in a much noisier ride. The interior noise is significantly higher on high-speed runs, such as the Red Line transition from running under Connecticut Ave to Wisconsin, or the tubes under the Potomac on the Orange, Blue, and Silver Lines. Unpleasant Lighting: The Light-Emitting Diode (LED) lighting is dreadful - even the Washington Post complained about the interior lighting, comparing it to that of the inside of a Xerox machine, serving as yet another example on how WMATA capriciously puts their own needs and interests ahead of those of the riding public, regardless of their effect on interior esthetics and passenger comfort. 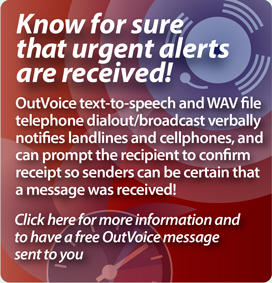 Computerized, Text-to-Speech Announcements: The 7000 series rail cars appear to use text-to-speech to generate announcements, but with software that sounds like it's from the 1990's! Couldn't they spend the money and license a more modern, sophisticated, and lifelike system so that passengers don't have to pretend they are re-living the movie "Tron"?? 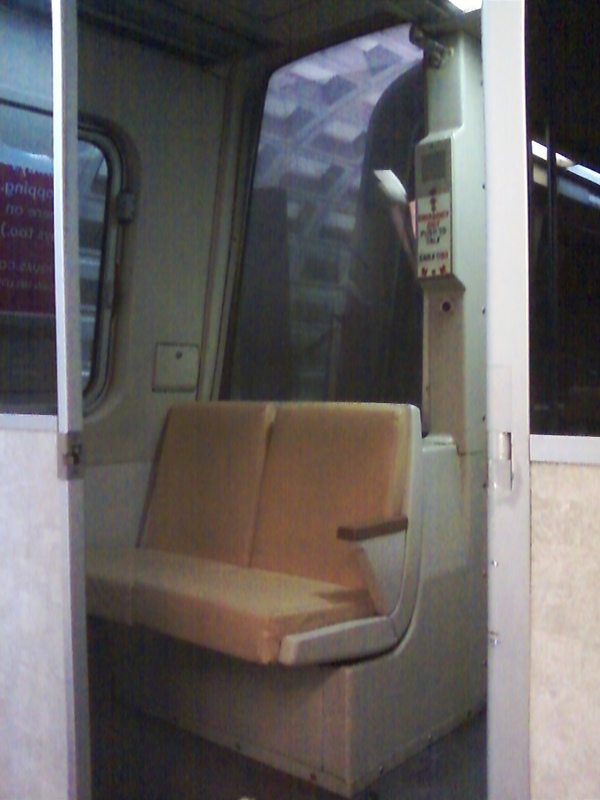 Lack of full door partitions: Older Metrorail cars had, to varying extents, full door partitions between the doors and passenger seats, which protected seated passengers from outside weather (heat, cold, rain, etc. ), as well separated them from other passengers congregated near the door(s). 7000 series cars have minimal door partitions which offer very limited protection/insularity from the outside, and allow rain, snow, etc., to come into the car under the seats and through the gaps in the partition's metallic frames. They also provide only marginal separation for those standing near the doors and those seated next to them. Lack of separate seating sections: While not intended purely for passenger comfort, older model cars provided passenger seats near the motorman's cab in cars where the cab was not in use (eg, cars not at the front or end of the train). As pictured in the discussion below, these seats provided for a "private section" which offered some relief on rides which sometimes had especially noisy passengers, often late at night (well, late by DC standards, 12:15 AM) on the last train out of the District. 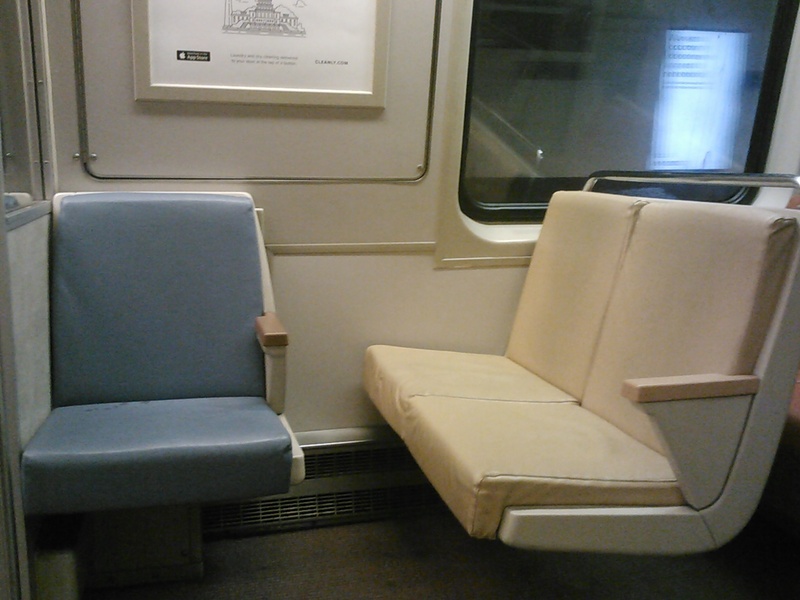 Thus, the 7000 series goes even further towards vitiating WMATA's early history of passenger comfort, and culminates this downward spiral of reducing cabin amenities for passengers simply to make operations easier for Metrorail. Have some of the carpets gotten old and stained? Sure...but that's what happens if you don't clean/repair/replace them. Are cushioned seats more expensive than the "hard cloth" seats of the 7000 series (similar to some NYCTA articulated busses with "no slide" seats)? Of course, but passenger comfort costs more than amenities provided for cattle and barnyard animals! 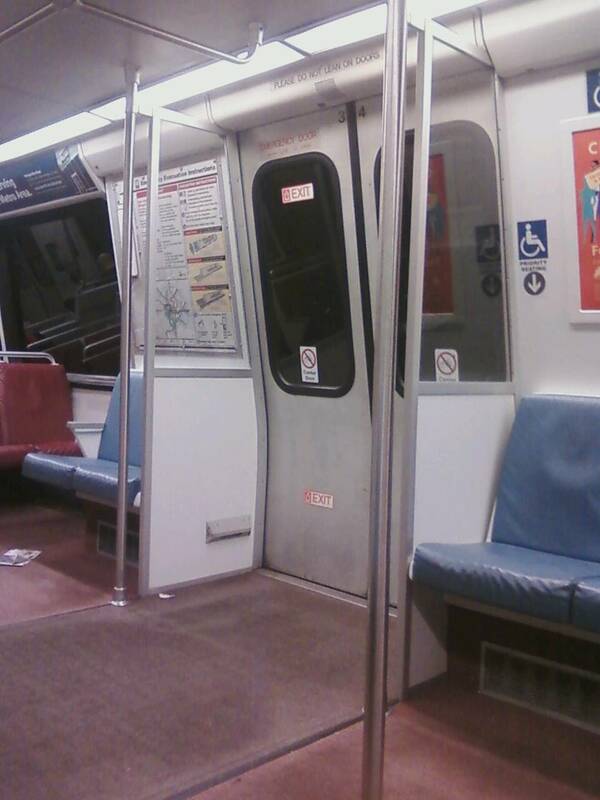 Do door partitions, along with the carpets and padded seats, help to absorb the at times exceedingly loud tunnel noise which WMATA trains make (due to the slightly less than standard track gauge)? Yes, and that's why we still need them! DC is not NY nor Boston and for over 35 years has stood apart from other US transit systems by putting passenger comfort ahead of administrative convenience in an effort to attract and build ridership. (As a side note, NYCTA's R-44's initially had carpets (view it here), and were much quieter, and the R-44/46s had full screens as Metro did (based it seems on the SOAC subway car with this great interior! 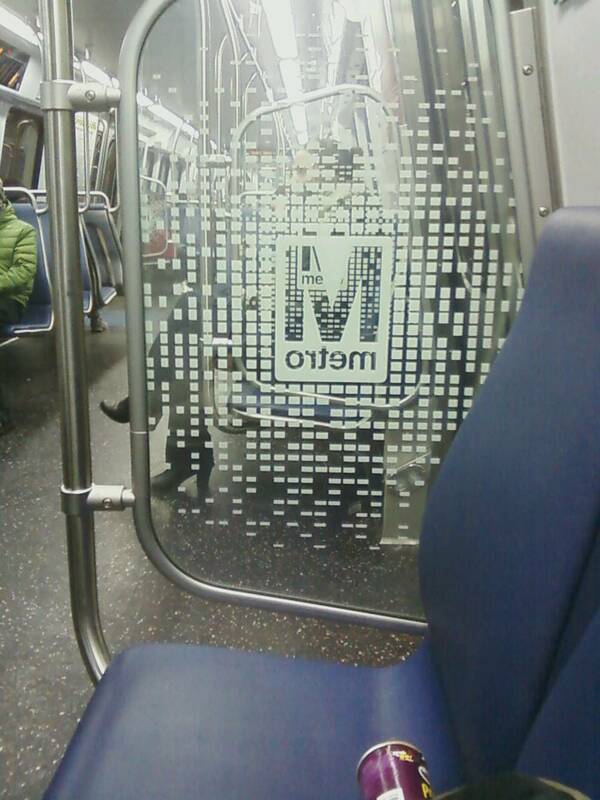 Typical of the TA, the 46's no longer have full screens (which were retained on the now gone 44s (except on Staten Island's SIRT)) as they are too cheap to put the transparent plastic in the frames, and it appears that WMATA/Metro is heading in the same direction as well). Petty concerns about passenger comfort? Maybe in NYC, where the roads are in such poor condition, the tolls so high, and the NYPD immunized against errant traffic citations by a Kafka-esque administrative law traffic court system (that circus is a whole other topic; for the curious reader, Google New York TVB administrative traffic court and read the horror stories; for an overview see the section labled "New York DMV Transit Adjudication Board" in this article, about halfway down the page), but in DC, where people have other options (ie, driving, especially after-hours and on weekends when the town is half-empty), and where Metro doesn't really go where a lot of people need to go (yet...), keeping people happy and comfortable on the train is a critical component to building ridership, and Metro is sending the wrong signal with its continuing attempts to masquerade its perennial self-interest in lower maintenance costs under the guise of modernity and ergonomics. 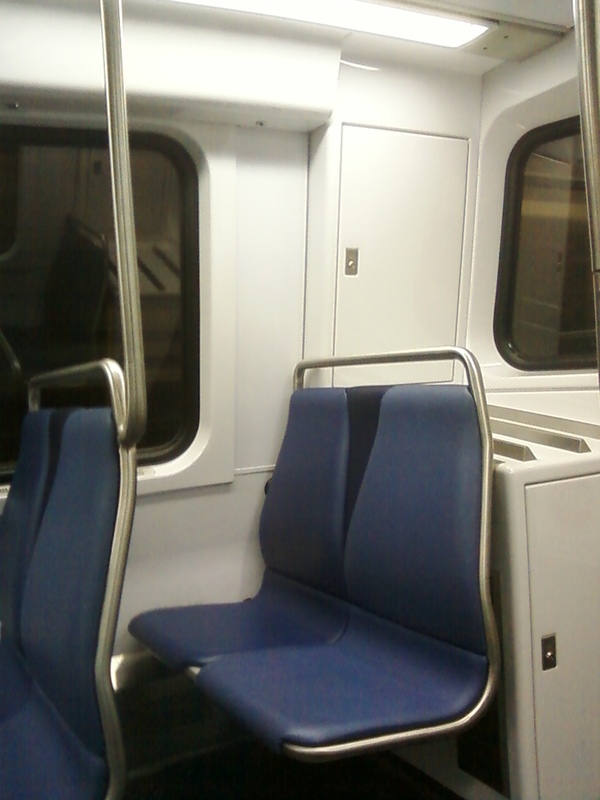 The interior of a typical 1000 series car with padded seats, carpeting and wind partitions at doors; this is a modified WMATA 1000-Series car, lacking a partition at the right back door in contrast to the left which maintains the original full partition. In addition to removing the carpeted floors, the 7000 series do not include full partitions common in other most train cars (both in the DC Metro as well as other rapid transit systems, such as the "Metropolitan"/"Cosmopolitan" "M"-series of commuter rail cars used in the NY Metro Area for over 40 years, even in today's contemporary and most modern variants (M7, M8). As many passengers stand by the door, the partition helps seated passengers from feeling too crowded. Additionally, they serve as wind/draft breaks which prevent exceedingly hot or cold outside air (in summer/winter) from blowing directly onto passengers seated next to the doors. The partitions/dividers also serve to keep rain, snow and the elements out of the seating section of the car. Finally, they also serve as a noise-break between the various sections, so that inconsiderately loud passengers (or groups thereof) can be segregated into a given section, minimizing their annoyance to the majority of the more considerate riders. 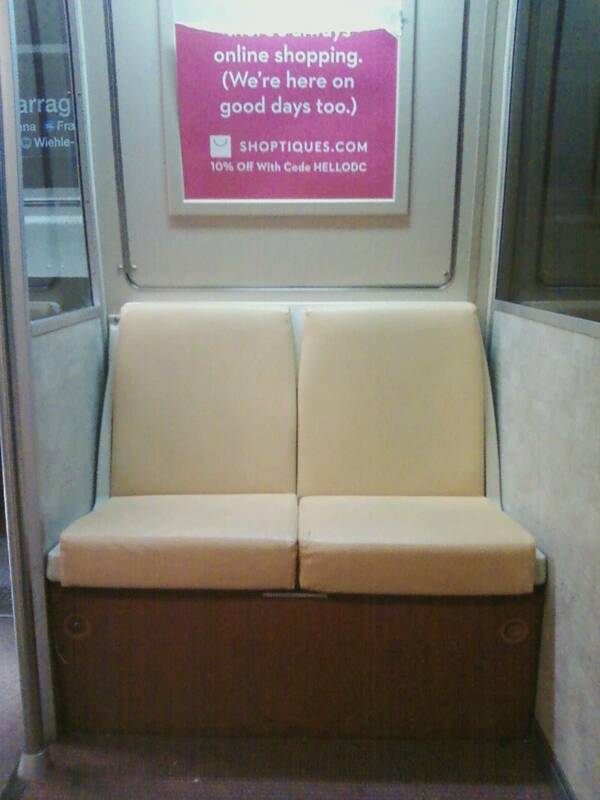 Two photos of the motorman's cab passenger seating on WMATA / DC Metro car 1183. The 'private section' is generally available to passengers when not in use by the motorman and not at the rear end of the train (where the motorman will occupy it when the train makes its return trip). Compared to many other transit systems, this area affords a section set aside from the main car body, and allows passengers to avoid noisy conversations in the main body. It is similar to the conductor's/motorman's "jump-seat" area on M-7 (LIRR/Metro North Harlem/Hudson Division) and M-8 (New Haven Division) commuter railcars. It appears that the WMATA 7000-series cars have no such section in force passengers into a tunnel-like car body with no way to avoid the noise of unruly/inconsiderate passengers other than switching cars. Note the carpeting in the seating section of the cab; many cars don't have carpets in the 'private seating' area making the ride a lot noisier. Car 1183 seems to have received new carpets, which were thoughtfully included in the motorman's cab area. The photo on the left is of a 5000-series 'private section', which is a pleasant amenity for passengers when the motorman's cab control area is not used in the given car. The center photo is of the 'private section' of a 3000-series car; closest to the platform at the window is where passengers may sit, while further away near the station wall is where the motorman would be if the train were being operated from the car. The right photo is where the 'private section' would be on a 7000-series car if provisions had been made to offer similar seating arrangements; instead, the 7000 offers fewer seats and no separated/private section. The 1000-series single seats near the non-cab (motorman's) side of the car. Note the arm-rest and full door partition/wind screen (no gaps or open areas from floor to ceiling), which both protects the seated rider from the outside elements and people standing by the door leaning on the divider, as well as provides a sound-barrier, which, along with the carpeting and wall padding, reduce noise and echo in the car's interior. The 7000 series cars have much less effective barriers which are smaller in size, have gaps between the barrier and seat, and which don't extend down to the floor, providing little protection from the outside elements nor standing passengers leaning on doors, and does little to mitigate noise, which may be one reason why rides on 7000-series cars are seem much noisier than on older, more comfort-centric models. Note: Compare the 7000 barriers with the also-limited 6000 series ones; both offer little protection/isolation, although the 7000 series ones protect the seated passengers from standing passengers a bit more. 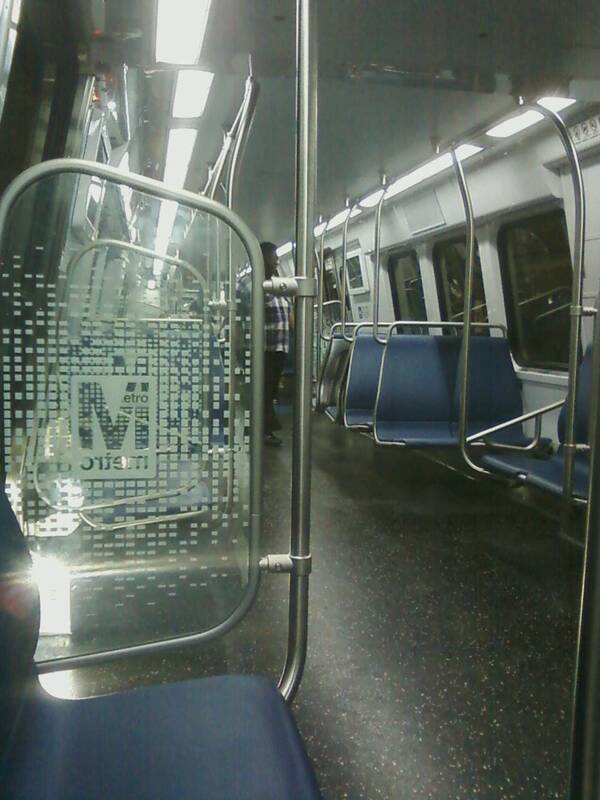 Besides offering a 'private section' on WMATA / DC Railcars when the motorman's cab is not in use, the various plastic screens and partitions on earlier model cars (as see on the the 1000, 2000, 3000 and 4000 series WMATA railcars) also serve to set aside two seats (and in the case of the 1000 series, a 'single seat' unique to that series) immediately adjacent to the motorman's cab area from the main car body and which also offers some degree of additional privacy as well as a shelter from the outside elements. Pictured below are the the two 'two seat' sections of car 1183; the 1000/2000/3000(? )-series have them laid out length-wise along the sides of the car, while newer series have them perpendicular to the car body walls and parallel to the cab seats, but one row closer to the main car body. In both cases plastic wind screens/compartment dividers are provided to separate these seats the general car body. 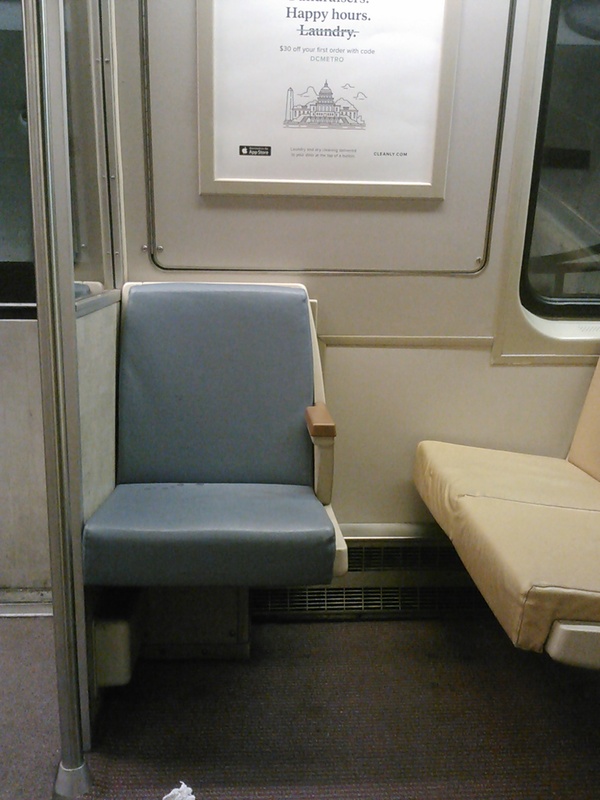 The isolated and separated two-seat sections immediately adjacent (and further into the car) of DC Metro car 1183, typical of the 1000 and 2000 series. Note the plastic dividers to isolate the seated passengers from those standing/leaning at the door area, as well as to protect them from the weather and elements outdoors. 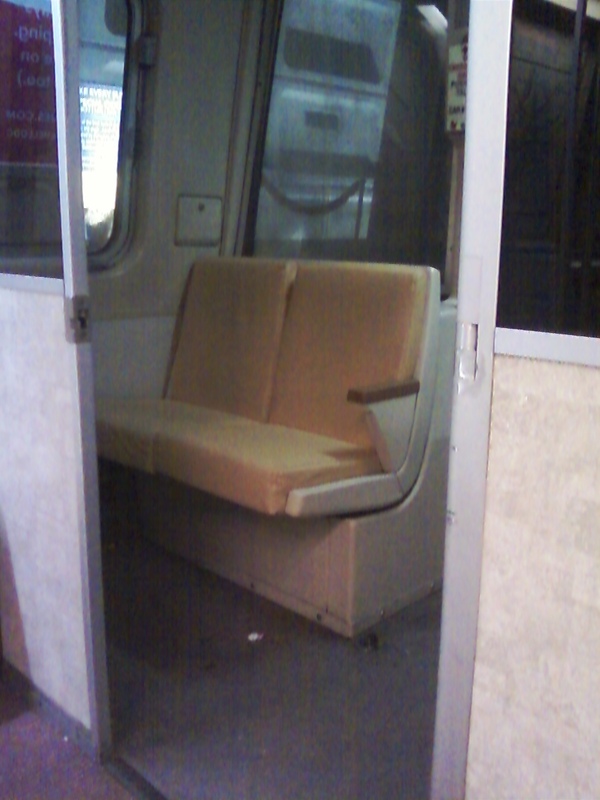 Later model WMATA railcars have have only one set of two-seats, with somewhat smaller (and less comfortable) padded seats parallel (instead of perpendicular) to the motorman's cab seats (not shown), but it too has a divider between it and the doors/main car body. Note the incandescent door light (rightmost image) which illuminates when the train doors are open - a much warmer and natural light than the newer, blue-ish LED lights which are much less effective. Would it really cost WMATA so much more to use the older, more visible, incandescent bulbs?? 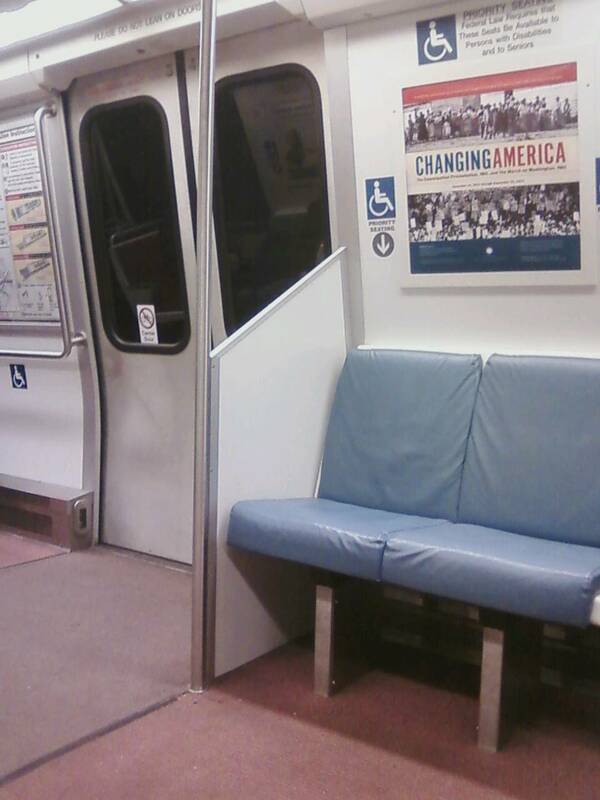 By failing to provide for similar dividers (which effectively block out the elements and noise) in the 7000 series of railcars, WMATA/DC Metro is effectively offering a less comfortable ride for both passengers immediately adjacent to the doors as well as the remainder in the area near doorways. The full door partitions of a 2000 series car. Note the walkway lights which illuminate the entrance area when the doors open - another well thought-out amenity from the 1960's/1970's design which has apparently been dropped in the 7000-series, along with more generally the full door partitions . 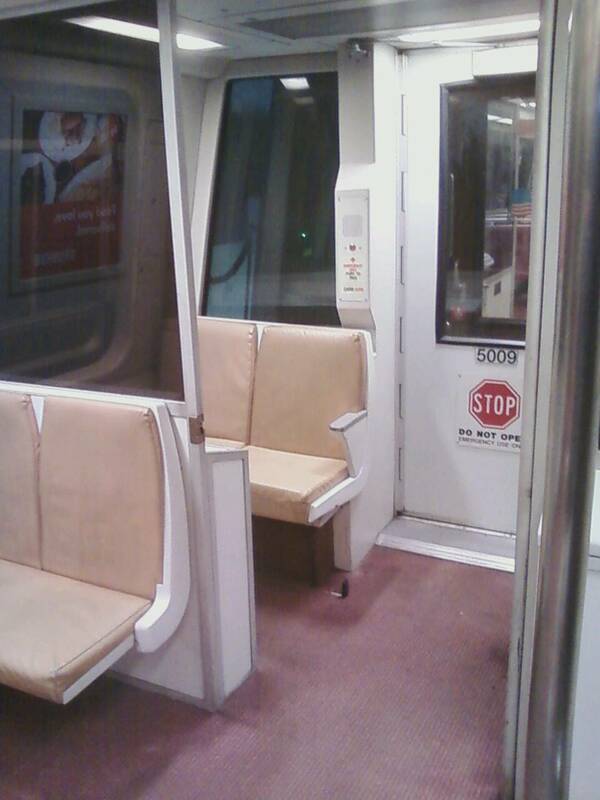 WMATA has reconfigured a few cars from the 6000 series to approximate some of the interior aspects of the prospective 7000 series; carpets were removed and replaced with slippery (when wet and/or when snow is present near the doors) vinyl/hard plastic flooring (second photo below), all partitions and wind screens bordering the door were partial and do not appear to offer much protection from the elements and/or other passengers (although not as pronounced as the angled-partition in the 6000 series pictured below). Some additional seating areas were also removed and interior lighting was changed from soft/warm white fluorescent bulbs to cool white fluorescent bulbs, giving the cars a pallid, factory-like, and unwelcoming ambiance. Additionally, the tunnel noise experienced on these "prototype" modified cars was appreciably higher and significantly more noticeable than that of the more insulated (vis a vis carpets and door partitions) and sound-absorbing interiors of the current, unmodified fleet. Note the middle door wind-screen and the lack of a partition as compared to earlier series cars. There is no partition furthest from the camera (to the left of the pictured doorway), and only a half-height, angled partition on the closer side. This configuration offers very little protection from outdoor elements for the seats located near the doors, doesn't filter out loud/noisy passengers from other sections in the given car, and also fails to 'buffer' seated passengers from people standing near the doors and leaning on the partitions. The interior of a 7000 series car's door panel/screen; note the gaps between the plastic panel and the supporting metal frame, as well as between the frame and the seating area: This allows for elements from the outside (wind, rain, extreme temps, etc) to easily enter the car interior, and affect those seated near the doors much more so than the solid, ceiling-to-floor panels on the 1000-5000 (and to a lesser extent 6000 series) cars. The interior lighting of the 7000-series is the pallid, industrial, cool-white fluorescent-ish (really cheap-looking LEDs) variety seen on some of the modified 6000 series, below. Also note the lack of carpeting, which no doubt in part results in the 7000 series cars having a significantly noisier ride. Two more views of the interior of a 7000-series rail car; the image on the left was taken from the far end inside of a 7000-series car, while the image on the right was taken while a trainset of 7000 cars had platformed. Note the door partition does not protect seated passengers' legs from rain, snow, etc. Providing full door partitions (let alone carpeting and padding in the walls to reduce noise) seems like a relatively simple way to enhance passenger comfort, yet WMATA staff have apparently become tired of cleaning carpets (better to let people slip, fall, and hurt themselves on wet vinyl??) and fixing the glass (or plastic?) door partition panels (not that many needed fixing) in a penny-wise and pound-foolish attempt to cut costs. 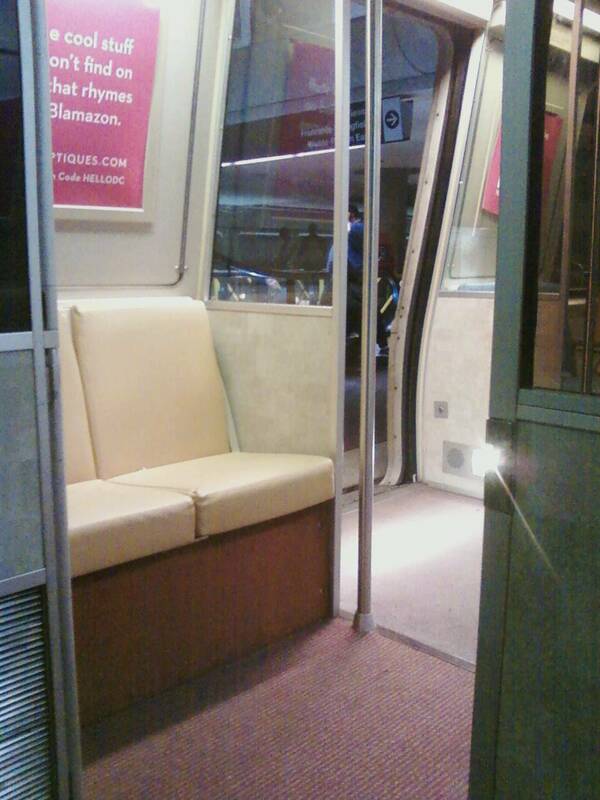 A modified 6000 series car with red velour seats (which is more than the WMATA 7000 series' small, harder, semi-plastic seats offer), limited and partial door partition dividers, and no carpeting, which results in a significantly noisier (and slippery!) ride. 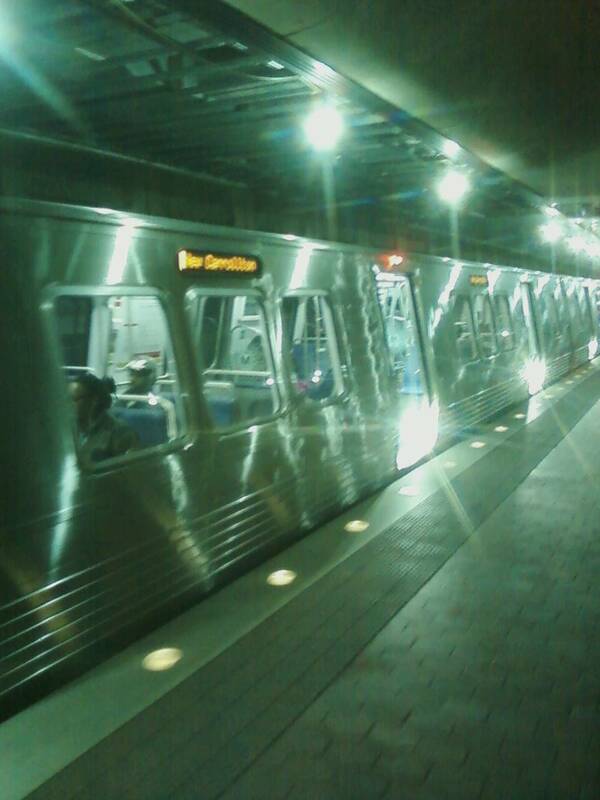 Also note the overpowering and unwelcoming cool-white industrial-looking fluorescent bulbs in these modified-6000 cars instead of the warm/soft-white varieties used in most other non-7000 series WMATA railcars. 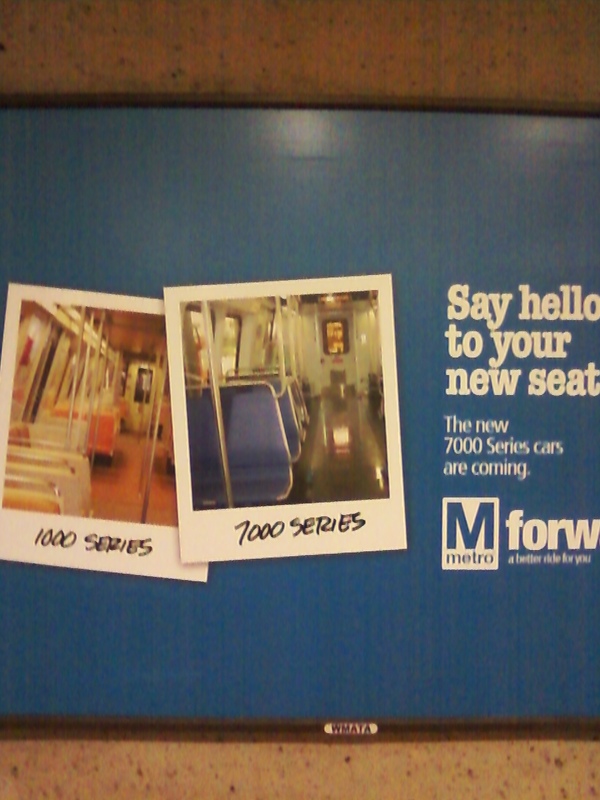 WMATA has recently begun promoting the future delivery of the 7000 series in numerous advertisements (photo below) throughout the Metrorail system. The typically self-adulatory prattle transparently applauds the 7000-series railcar's improvements in passenger comfort, as if the 7000 cars conferred some actual, tangible benefit to passengers, rather than just WMATA's desire to spend less on passenger amenities. While the 7000-series may be precisely what WMATA needs/wants in terms of saving money on cleaning cars and other associated maintenance costs, despite WMATA's no doubt well-researched and sourced 'consumer feedback', it is likely not what the riding public - their customers who pay the bills want, but why should WMATA concern themselves with such minor trivialities? And yes, the 7000-series railcars are supposedly more reliable than WMATA's 4000-series, and safer than the 1000-series (which are now all placed in the center of trains so the "telescoping" issue of the 1000 series shouldn't be a problem in collisions). And yes, they will cost less to maintain mechanically. But there's no reason why the passenger comfort amenities which Metro introduced in the 70's, and which made the DC system one of the more passenger-friendly systems in the United States, need be sacrificed with the introduction of the 7000 series cars. Metro could outfit 7000-series interiors as a modern, updated variant of a 2000-ish series car, with carpeting, full door partitions, warmly-toned lighting, simple and straight interior lines, etc, but instead opted for a cheap, plastic, "we need to be able to hose down the car after you filthy passengers leave" interior instead. Basically, it, as always, comes down to money and maintenance costs, which, until now, were apparently and readily well-borne by the Metrorail system, and evidenced in the more comfortable earlier model series, which afforded passengers a more quiet, comfortable and satisfying ride. We are now being told/sold on the notion that the plastic, 'hollowed out' 7000-series interior - more typical of a school bus than a rail car - which the 7000 series will inflict upon the riding public is all WMATA is willing to put up with or pay for, passenger comfort be damned. 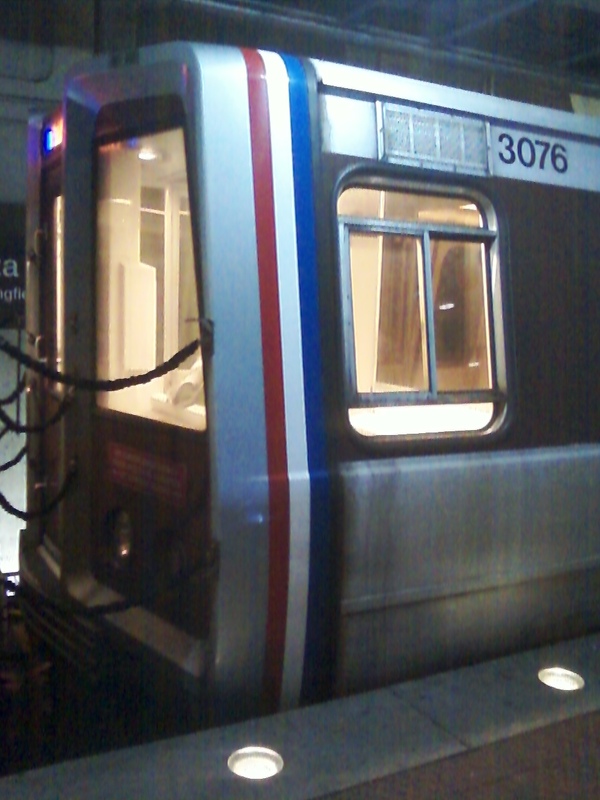 At the very least, it would be a refreshing change if WMATA (or any other government, quasi-governmental, or similar entity these days) would be honest and just say 'We don't want to pay for passenger comfort any more than the de minimis amounts which we can get away with, so here is the 7000-series car which is well-suited to our budget and the filthy people who cause us so much work after they dirty our fleet - enjoy! ', rather than couch a decision which is deleterious to the riding public in mindless verbiage and adulatory self-promotion in an attempt to convince them otherwise. So, like many other things in America these days, WMATA is paternalistically telling it's ridership 'We know what's best for you!' and 'prepares' the riding public for an effective dimunition in the service and comfort they have came to (and should) expect, with transparently self-serving and condescending advertising fashioned to inculcate a false self of progress and improvement, which in actuality is masquerading WMATA's inability and lack of desire to maintain passenger comforts and amenities which had been its hallmark since its inception. 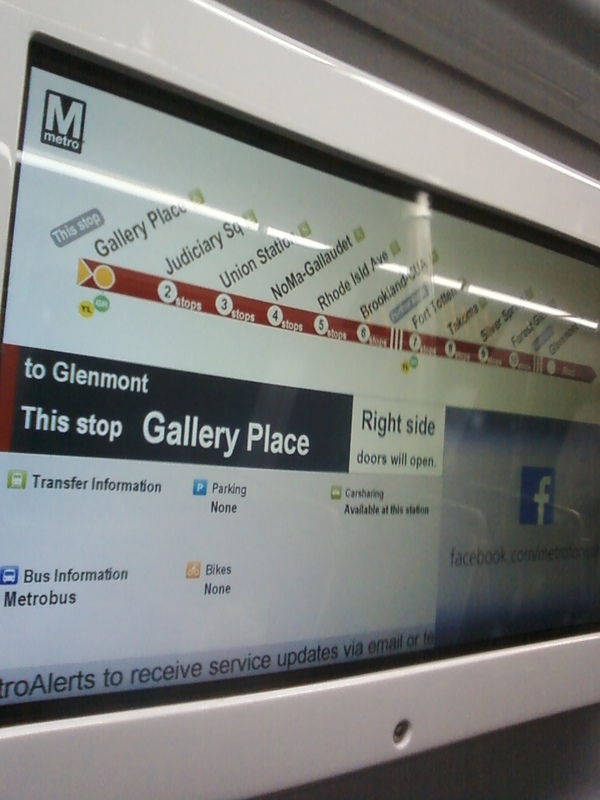 The interior route position/display map on a Red Line 7000 series car, showing the current position, nearest station, and station services at the given station. While a nice amenity, they are hard to see from anywhere but right near the map, and do little to alleviate the other areas in which passenger comfort has been significantly diminished, such as noisier rides (likely due in part to a lack of carpeting and extensive padding on the seats and ceilings), lack of proper door screens and interior partitions, and poor, dim, industrial-looking lighting. It's relatively easy and cheap to put in a flat panel display and say 'Look how much we're improving!' (and some of the text on the displays even come close to iterating that sort of silly mindless cheer-leading! ); it's more costly (somewhat) and harder (also somewhat) to maintain a more comfortable set of seats, quieter interior ride, and partitioned interior as do the 1000-5000 series cars, yet for years WMATA has been (barely) able to do so, and the 7000 series cars are just a retreat from this standard since it appears they just don't want to spend the money needed to maintain the higher standards which they used to since Metrorail's inception in 1976. As usual, save money, cut back, and pretend/tell/skew the public discourse into making it seem like WMATA is making progress. 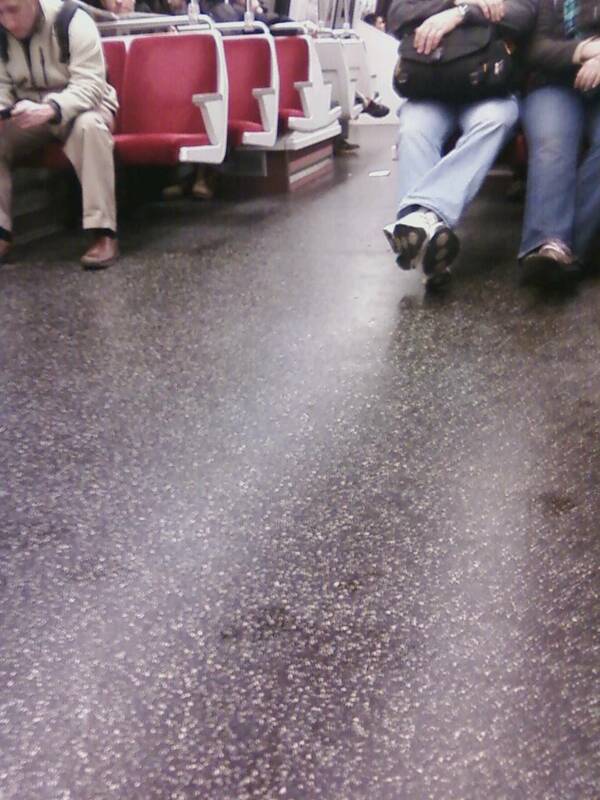 When the 8000 series comes along, why not just take out the seats and spread some hay on the floor and be done with it? 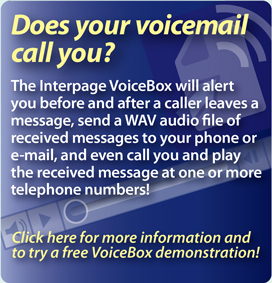 E-Mail: Please mail to abcwireless@interpage.net, removing the first three letters of the alphabet from the name/address. 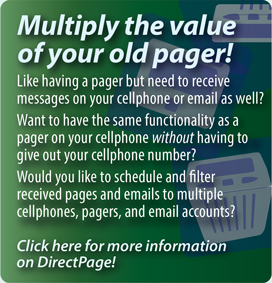 Phone: +1 (802) 316-5000 during business hours.